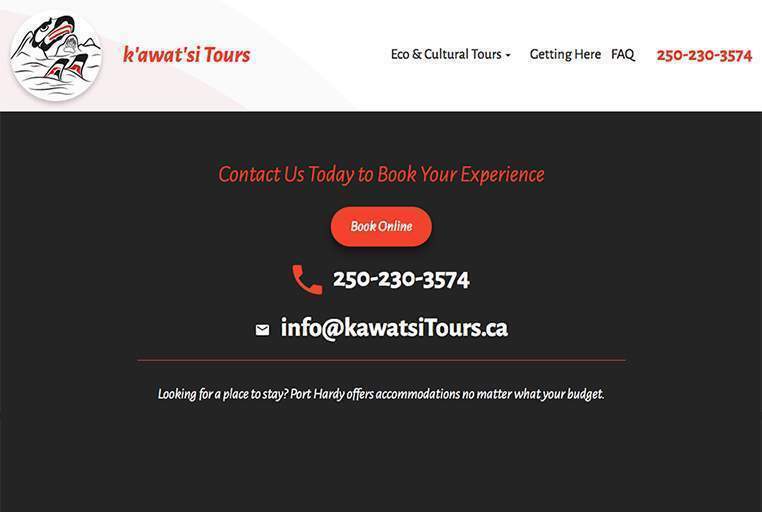 Booking with k’awat’si Tours just got a lot easier! If you want to take a scenic boat & wildlife tour or hike around San Josef Bay, you can now book your North Island experience online! By adding online booking, adventure companies and service providers, like BC Ferries, Pacific Coastal Airlines or Jonview, can coordinate and promote tours for their customers. The new online booking program also allows you to make changes to your tour schedule. Check out the new feature and book your tour today at https://kawatsitours.ca! If you are a tour provider and would like to get in touch, please contact davis@kedc.ca. Screenshots of online booking tool on k’awat’si Tours website. ©2019 k'awat'si Economic Development General Partner Corporation.